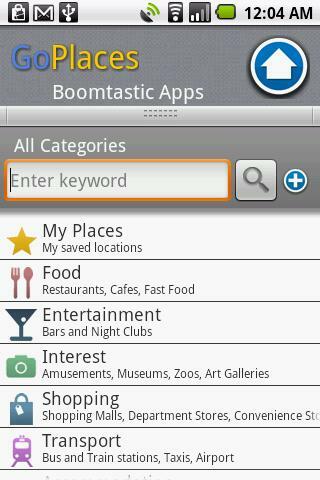 Boomtastic Appsbrings us the new social/travel discovery app called GoPlaces which is available forAndroid,iPhoneandiPad. Ever needed to know what bar is around you? How about what coffee shop to meet at? GoPlaces solves this problem by allowing you to search by location, category, keyword and much more. GoPlaces helps you to find both places you’re looking for as well as discover new places. Once you start using GoPlaces you will realise it is your one stop shop for finding places you want to go. Whether you are looking fora place you know the name of or just a bar to grab a beer, you want to be able to do it fast. GoPlaces can show you a list of places by category in just two pushes. To browse GoPlaces by category all you have to do is drag the grey menu bar up from the home screen and select a category. A list is then displayed and sorted with the closest first, then all you have to do is click on the place you want. Google Places has been integrated to give you a massive selection of places so you will always find what you are searching for. The default navigation mechanism is the compass however this would be great if you could select either the compass or map as the default method of navigation. Lets hope this comes out in future updates. Once you have found the place you want, maybe you want to tell your friends to meet you there or even brag about where you are going on Facebook or Twitter. 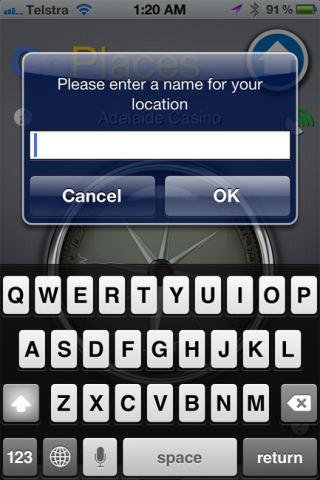 GoPlaces allows you to easily share the location via text, Facebook or even a quick Tweet. Social media became mainstream a long time ago, and integration with Facebook and Twitter is expected. However, having the extra option to share via text with your folks who are still using Nokia 5110’s is a huge bonus and more useful than you might think. GoPlaces allows you to contact the place you are going simply and easily from within the app. Whether you just want to check out a restaurants web page or call to make a booking at a hairdresser GoPlaces has got you covered. I have always found it annoying having searched for a place in older apps and then needing to Google the place, find the phone number, exit the web browser and then dial. That makes me tired just typing it. Having this all at your fingertips while you are browsing is really handy. 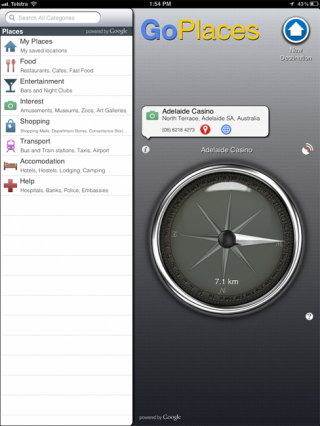 The interface in GoPlaces is modern and sleek. The clean minimalistic backgrounds, stylised compass and simple icons makes this app really easy to navigate and great to look at. A solid all-round app, if I had to find an annoyance it would be on the Android version when you click the back buttong from the “Select A Category” screen it actually exits the app. This has caught me a few times and would be great if it could just go back to the main screen. 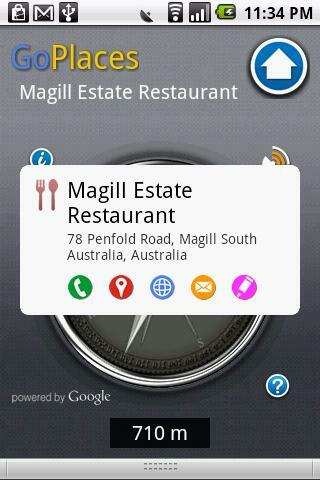 Aside from that,Boomtastic Appshave done a great job so go check out GoPlaces onAndroid,iPhoneandiPad.